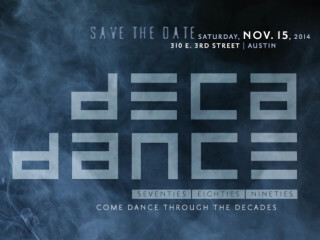 Come "dance through the decades" and support Forklift Danceworks! Forklift's annual dance party fundraiser will transform Textile into a night of pure "DecaDance" during one of the most fun fundraisers of the year. Enjoy an open bar with signature cocktails, tunes from DJ Mahealani, photos by Sarah Bork Hamilton, a silent auction and raffle, surprise guest performances and a midnight snack — all with Austin's hippest philanthropists (including you! ).